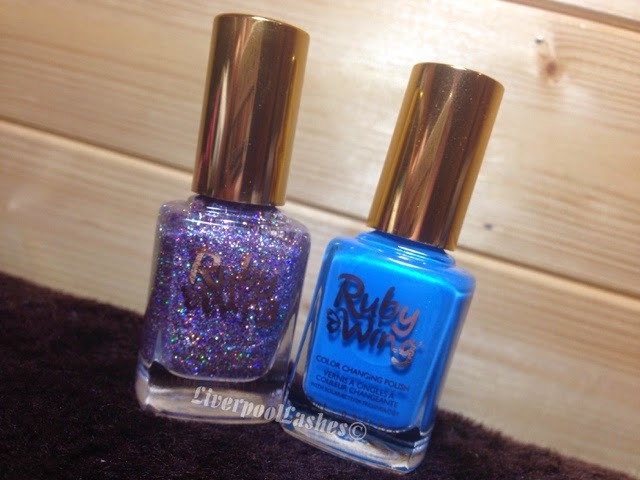 Today's post is on the Ruby Wing Colour Changing Nail Polishes that I recently received to trial. I have to admit, when I think of 'colour changing' products I instantly think of the little teddy bear pendant that I had when I was a child with the mood stone it and all of the mood stone rings people had. That aside, I must admit that I wasn't sure how much I was actually going to enjoy the concept but I was extremely excited to try them. What makes Ruby Wing unique is that it's created using SolarActive® Technology which means each shade dramatically changes in direct sunlight and then back again once inside. Festival is a holographic lilac/silver glitter when it's worn inside, once out in daylight it transforms into an amazing deep purple glitter. 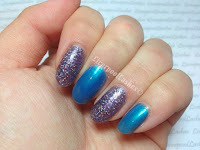 I have to be honest I completely doubted that glitter could change colour - but it does fantastically well! Even now I can't get my head around how it actually changes the colour of glitter! Moonstone is a stunning Mediterranean turquoise shade with a slight shimmer when it's worn indoors and then when once you're out in daylight its an amazing deep navy/purple. 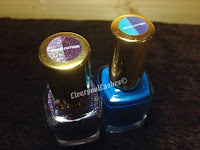 The colour changing process will stay on the nails for around ten seconds once it's removed from the sunlight.
. After my initial scepticism, I couldn't of enjoyed wearing this polish more! 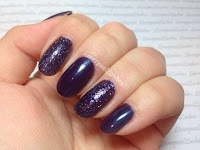 The glitter polish was exceptionally sparkly to the point where as I could compare the finish with CND Shellac. I loved the combination of the shades together both inside and outside in the sunlight. I do feel like in the winter months it's likely that your nails will stay the inside shades for the majority of the day but they do still gradually change throughout the day anyway. I highly recommend that you try the Ruby Wing range which would also be fantastic over enhancements, I've already had quite a few interested clients from it! Ruby Wing is available via Creative Academy+ Manchester for collection. If you're outside of the north west, you can also order online as Sweet Squared.